Watching a horde of spring bluefish swirl, smash and finally get hooked on a surface popper is one of the greatest thrills in fly-fishing. 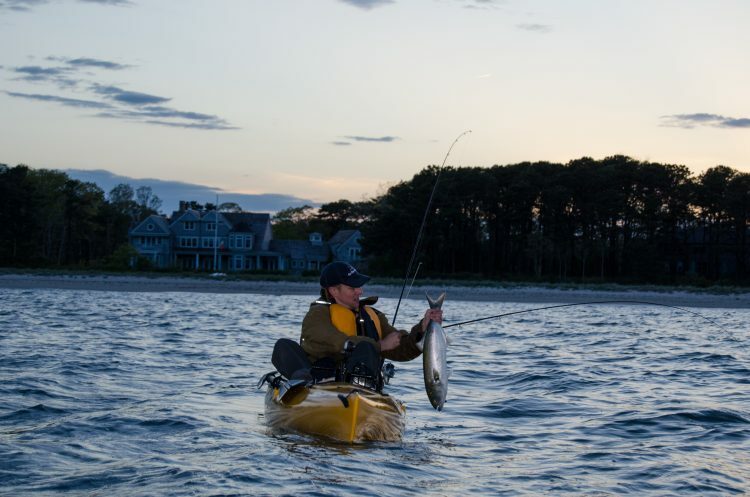 Pound for pound, many fly-fishers consider the bluefish to be a better fighter than the kingly striped bass, and certainly better than a weakfish—and I believe it too. 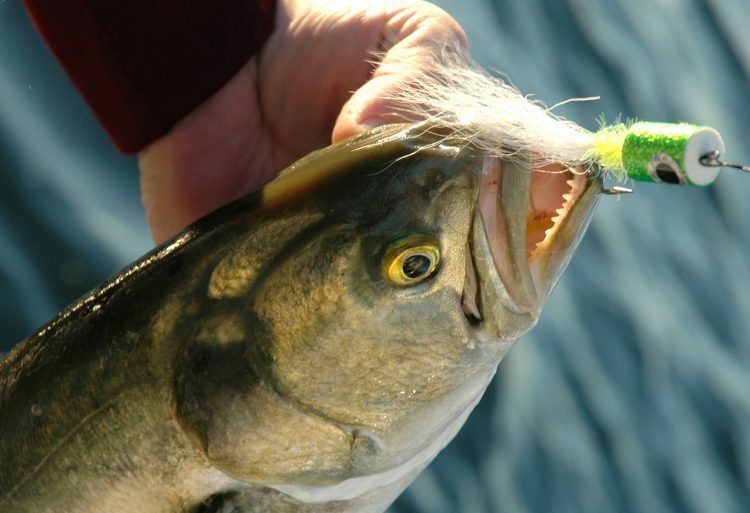 While the strike of a weakfish is like a hard punch and a striped bass makes aggressive, strong runs, bluefish slam the fly like a hammer, run like crazy and usually throw in dazzling acrobatics to jazz up the fight. You gotta love ‘em! 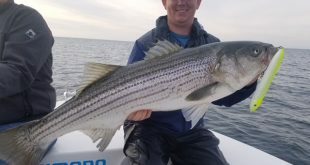 Many a striped bass hound, weary after throwing hundreds of casts before sunup, calls up a last burst of energy, changes the fly and spends another hour casting to, and catching, a handful of bluefish before calling it quits for the morning. Other fly guys, fresh from breakfast, skip the dark side and start casting at sunup to cruising bluefish until the tide finally quits and the toothy critters pause, satiated until the next feeding spree. If you get a dropping tide that starts at first light, the bluefish bite may be reliable until lunchtime. 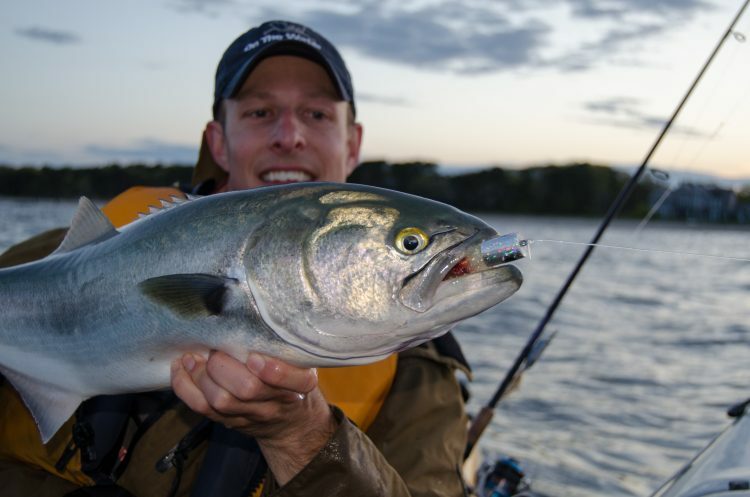 One of the most exciting ways to fly-fish for May’s bluefish is with surface poppers. The hook-up and the tug are cool, but bluefish fanatics get a bigger thrill out of the repeated swipes and misses as bluefish after bluefish swirls at a popper, misses, turns around and tries another swipe. This is laugh-out-loud fly-fishing at its best. The only downside is the need for a generous supply of poppers. 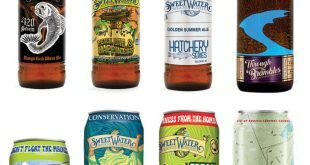 Bluefish chew the heck out of the old-fashioned cork-body poppers, and it’s not unusual for a single bluefish to destroy a cork popper. On a mad-dog bite you may need a dozen poppers to catch a dozen blues! You’ll need fewer poppers if you fill your fly box with a dozen Bob’s Bangers, a terrific surface fly designed by the legendary Bob Popovics. The foam popper head is superior to cork. You need a long-shank hook like the Mustad 34011 or TMC 9394. As an alternative, Shell E. Caris of Shore Catch Guide Service uses a 7/0 Owner Longshank Ballyhoo hook because the wide gap often gets a better hook-up ratio than a standard long-shank hook that has a narrower opening between the hook shank and the hook point. To build a Bob’s Banger, start with a tail of bucktail, nylon or Steve Farrar’s Flash Blend, then wrap about an inch of Estaz or Estaz Grande before slipping on the foam head. 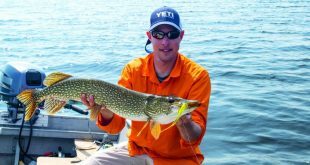 Three-quarter-inch diameter foam is a good choice and is sold at fly shops in 1.6-inch lengths. Cut the foam in half to get two heads. For the best popping action, make a hole dead center in the foam by heating an old bodkin and pushing it through the foam. Wrap a base of thread along the hook shank where the popper head will be cemented in place. The wraps help secure the foam, but it really doesn’t affect the Bob’s Banger’s fishability if the foam rotates a little. The center position of the hole is important because it provides the best splashing action and because the Banger can easily be lifted from the water to make the next cast. When tying Bangers for “show” I like to use reflective tape for a nice appearance, but bluefish often don’t seem to appreciate the extra effort, so when tying for battle I usually leave off the tape. The color can be varied by using different foam, tail and Estaz body colors, and a marking pen adds color to the white foam head, and ditto the marking pen for the eyes. When prospecting for bluefish that are not splashing on the surface, a quick pull on the line will usually create a nice splash from the Banger. Let it pause, then strip again, repeating until a bluefish nails it. It is important to start the strip retrieve when the Banger hits the water. Shoot the line through a ring formed by the thumb and forefinger of you stripping hand so you can grab the line with no wasted time. That first second can be critical. If you see bulges of water as bluefish actively work the surface, make your first cast near the edge of the disturbance so the line does not spook the fish. For all their aggressiveness, bluefish aren’t stupid and unless they’re in blitz mode, the fly line doesn’t look natural and can spook them. Use several short, rapid pulls to make the Banger splash and plunge. 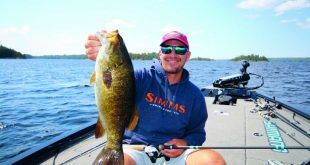 When the blues are wildly crashing bait, a cast to the center of melee will get strikes if the Banger has no movement at all, just an occasional strip to keep the line tight as the boat drifts or as the fly drifts with the current.